Teflon ring for Turbo Hybrid. 12"
Teflon ring for Turbo Hybrid. 15"
Great for pet hair, crumbs and lint. 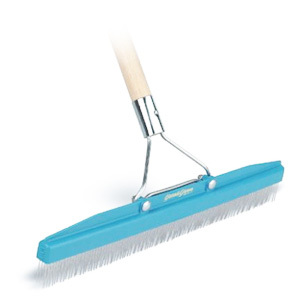 The fine rigid bristles make it ideally suited to release soil particles and foriegn debris from furniture and other soft fabrics. The handi groom is compact, yet versatile. Fits in your pocket, great for carpet spotting and finishing in tight quarters. For those occasions when brushing is required. Quality dupont nylon fibers offer heat and oil resistance for long lasting performance. 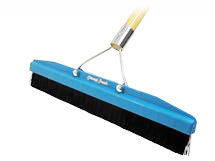 The professional's cleaning tool for loosening embedded soil, working in preconditioning solutions, and finishing. 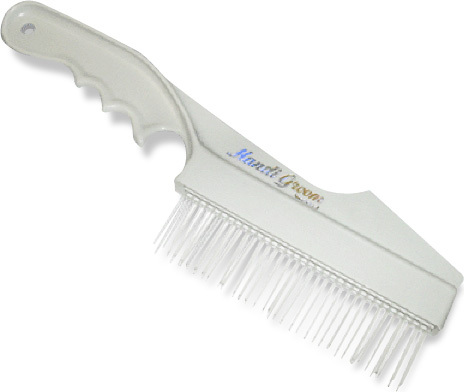 Stiff white nylon bristles are durable and highly resistant to acids and petroleum solvents. White tampico fiber for upholestry and leather cleaning. Great for cleaning delicate fibers because it becomes extremely soft when wet. Recommended for upholstery and leather cleaning. White tampico set in foam plastic block.